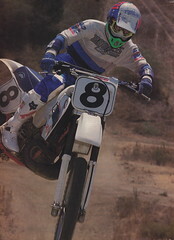 Time for another one of the classic Motocross brochures from my personal collection. This one covers the first motocross bike I ever owed, the all new 1978 Honda CR250R Elsinore. This was the first CR to feature long-travel suspension and the first to wear the “R” moniker. Originally, this was used to denote the ’78 CR250’s status as a “Works Replica”, but eventually, the “R” would become an edition to all of Honda’s motocross racers.